Sorry we haven’t visited in a while, life is quite crowded for Mom. We love your black and white pics… Mom is going to try and play with that a bit in a little while. Torrey is looking great! 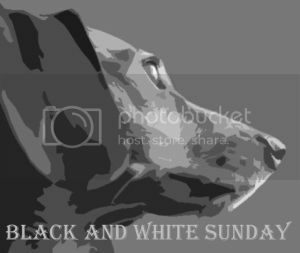 Thanks for sharing this photo of her in black and white and she is really black and white. Awww….what a great photo! She looks like she is having a great time. Look at that big smile!!!! What a great black and white photo! Happy Sunday our friends! Wow you are a cutie! Now that is one happy dog! Roxy – I have a feeling you keep your humans very, very busy. That look reminds me of my Sheltie, Jasper. Great picture of you!